I have purchased a Windcamp 3000mAh battery kits complete with charger, back plate and stand. I have charged the battery for at least 3 hours until the charge light went green, Then I left it for an hour or so and then charged it again to make sure (why I dont know). I went on the summits today to try this out. My first attempt at a full CW Summit qualifier. I managed 5 or 6 QSO’s then the power light on the 817 started flashing with the bars. As far as I am aware that usually means low battery? so I turned the internal battery off and used my 3.2 Ah slab that I took just in case. Is this battery faulty or have I done something wrong? Also I would like to thank the chasers that made the QSO’s with me as I was nervous and very cold. Paul. Thanks in advance for any reply’s. Not at all, the power flashing bars means you are near the full power (5w). May be you can set and watch the voltage 12v on the display. I use WLB-817 since few years and have never problems. I have read on a couple reviews where folks have had that same issue. Regardless, and with trepidation, I ordered that battery/charger/back plate anyway. Have not taken it on an ‘activation’ per se; have used it when portable and at home and have not had that issue. Battery life has been good - so far. One thing I have noticed though is if I am holding the radio while using it is that I have accidentally moved the power switch to off. Sounds like a faulty battery as the charger supposedly shuts off when battery is fully charged - supposedly. You might want to recharge it once again and see if this repeats. If so, see if you can exchange/return the battery. Not so sure how well that will go if an eBay purchase but good luck! Good point that I had missed! Yes, if voltage goes below 12V and on High power the bars light up and you can continue until the battery drains. Hope that is what is going on with Paul! just to confirm what the others are summising. 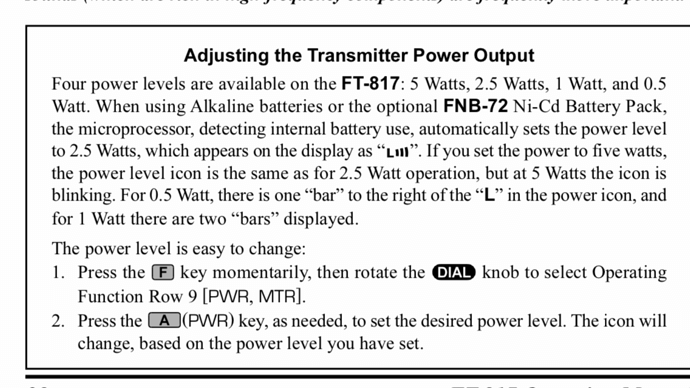 The “power light flashing” - is that the power output indicator in the bottom of the LCD display? 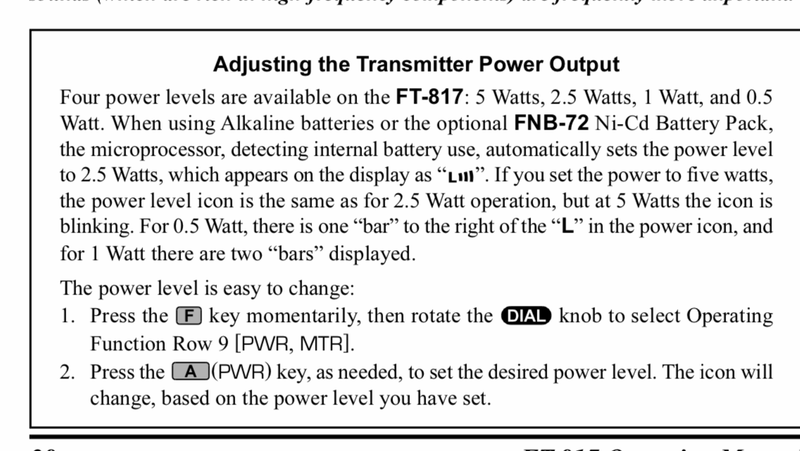 If so, as was said, this is good - it means you’re running at a full 5watts output. If you are saying some other actual DC voltage driven light on the 817 is flashing, then that’s a worry. I saw the kit you have and decided to do it the cheap way using a 2500maH 3S LIPO battery from Hobby king, and that has worked fine for the last 6 years. In fact I have just replaceed the battery with another identical one as it stopped taking a full charge. I take the battery out and charge it on a balanced charger. I’m niot sure how the Windcamp solution works, but as long as it has separate balanced charging of each cell, it should be fine. Yes the display at the bottom of the screen of the 817, I thought the bars were the different wattage and if they all flashed the battery was low. My mistake then so it might be ok. I have just read the manual lol I never realised that internal battery is 2.5 watts unless 5 watts is selected. I have never done an operation with the internal. So fingers crossed the battery is fine. How long using cw and ssb would you think I should get for a portable operation ? It’s the 3000 mAh version. An 817 draws about 2A on TX and 400mA on RX (roughly). So a 3000mAHr battery should run an 817 on TX for 1.5Hrs continuously. You don’t transmit all the time and modes like SSB and CW are not 100% duty cycle which increases the life. I’d expect to be able to operate easily without worry for 3hrs continuously with such a battery. There are other factors which affect that time, temperature (less when cold), age of the cells/number of charge/discharge cycles, quality of the charger, exact nature of the transmission and time on TX, whether the cell is really 3000mA capacity (manufacturing tolerance). I have probably the same kit for my 817. When the battery is fully charged, the voltage is high enough that the radio “thinks” that it is powered externaly, so the 5W TX power is indicated by missing icon. After a period of activity the battery voltage drops below the theshold and 817 switches to “battery mode”. Now 5W TX power is indicated by blinking battery icon. Could be confusing, I know. I was confused the first time too. When the battery voltage drops below safe level, the protection circuit kicks in and suddenly cuts off the power supply. The 817 could work on even lower voltage, but it would damage the battery. In my experience, my Windcamp battery has enough juice for at least two SSB activations on two bands, and even after that it gets charged quite quickly. I get 2 to 2.5 hours of intensive ssb operation with a 2200mAh 3S LiPo so expect 3 to 3.5 hours from a 3000mAh unit. It’s amazing how much of the power put into it the 817 turns into heat - putting your battery on top of the radio in freezing weather keeps it toasty warm and makes sure you can get it’s full capacity out of it! How long using cw and ssb would you think I should get for a portable operation ? I’ve had a new battery to use for a few weeks now but bad WX and a cold stopped me playing. Anyway today I had the following QSOs: 24x 60m SSB, 8x 40m CW, 6x 30m CW 5x 20m CW at the 5W setting. My 4200mAHr LiFE cell was fully charged up 2 weeks ago. i just connected it to the charger which says it’s at 83% full after 1hr30 of use. If I’m reading that right, then I am very pleased. It also suggests my 9 year old LiPOs (4000mAHr) are quite well “worn” as both of them after 1hr30 use would be probably be about 50% full. I’m using the Windcamp LiPo since last year. Mostly charge it with a processor charger and logging the process by PC. Once and only once I discharged the cells for test near 5 %. Later charging brought a little bit less than 3.000 Ah into the battery. That seems to be ok.
Two difficult activations on one day discharged the battery until switch off (not so good for lifetime). It was accidentally and not for test. With many calling in SSB with 5 W the switch off was after 3 hours. So I think this solution works fine.